In the summer and fall of 2017, a wave of devastating violence sent hundreds of thousands of persecuted Rohingya people fleeing their homes in Burma, filling the news with brutal stories of a people under fire. Here’s a primer on the crisis. The Rohingya people are an ethnic minority group from the Rakhine State of Burma. They have a unique language and culture, and while they live in a predominantly Buddhist country, the majority of Rohingya people are Muslim. The Rohingya community has lived in Burma for centuries, yet they are reviled as outsiders, accused of being illegal immigrants from Bangladesh. In 1982, the Burmese government stripped Rohingya residents of their citizenship, and through subsequent waves of violence destroyed their communities and denied them freedom of movement in the country they call home. Over 687,000 Rohingya people have fled their home, Rakhine State in Burma, for Bangladesh. How large is the Rohingya community in Burma? As of 2015, there were approximately 1 to 1.5 million Rohingya people in Burma, though the exact number is unknown. Because in Burma the Rohingya community is not officially recognized as an ethnic group, in the 2014 census the Burmese government refused to count Rohingya residents unless they declared themselves Bengali. In 1962, a military coup in Burma hurled the country into a military dictatorship that has severely oppressed many ethnic minorities, including the Rohingya community. Because of ethnic, religious and political differences—and because of shifting demographics—Rohingya Muslims and Rakhine Buddhists have long been entangled in a cycle of tension, flare-ups of violence, and retaliation. The Burmese military has consistently stoked violence against Rohingya people and suppressed their uprisings with brutal force. In 1982, the military regime passed a citizenship law that gradually rendered Rohingya residents stateless. 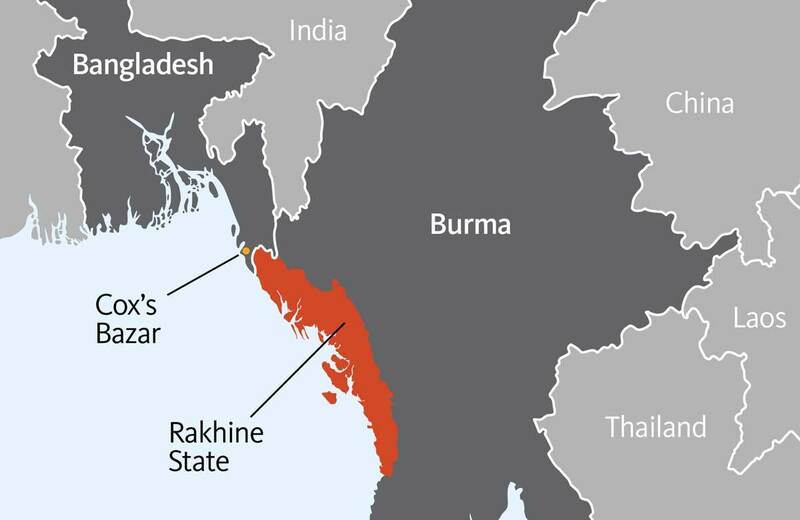 Ever since, Rohingya people in northern Rakhine State have needed authorization from the Burmese and Rakhine authorities to travel between and even within towns. In June 2012, after a new wave of violence, Burma’s security forces forced many of the state’s Rohingya population into Internally Displaced Person camps. What sparked the latest crisis? In just three months, the military has driven more than 700,000 Rohingya refugees into neighboring Bangladesh—thrusting the Rohingya people’s plight into the international spotlight. What is happening to the Rohingya refugees? Since August, more than 700,000 Rohingya refugees fled across the border, making the multi-day journey into Bangladesh on foot or by boat. Many refugees walked to Bangladesh with severe wounds. They crossed a border region dotted with landmines planted by the military, and many suffered casualties. Those who made it to Bangladesh now live in sprawling, overcrowded refugee camps, where the situation remains bleak. There is a dire shortage of adequate healthcare, and infectious diseases are among chief concerns. Approximately 67% of the 58,700 pregnant women living in the camps do not have access to obstetrical care. Water contamination and waterborne illness remain a significant issue, as the World Health Organization reports that 81% of water samples collected in camps are contaminated with E. coli. And as the monsoon season fast approaches, experts worry that worsening landslides, contamination and disease will decimate entire communities. How will monsoon season affect refugees in Bangladesh? Monsoon season—an annual period of heavy seasonal rains in South Asia—has recently begun, causing serious damage to the makeshift Rohingya refugee camps in Bangladesh. Three refugees have been killed in landslides—including a two-and-a-half-year-old boy—and at least 14 Bangladeshis have perished in neighboring communities. More than 1,000 shelters have been destroyed so far. Safer ground remains scarce and inaccessible. Though nearly 2,800 people have been relocated and an additional 500 acres of land have been made available by the Bangladeshi government, another 30,000 refugees remain in imminent danger of landslides and floods—and the chances of moving them to safety are slim. To make matters worse, the rainy season is expected to exacerbate the spread of water borne illnesses, such as cholera and acute watery diarrhea. What is happening to those who remain in Burma? An estimated 200,000 to 500,000 Rohingya people remain in Rakhine State, including approximately 120,000 who are in camps in Sittwe, the capital. While it is difficult to ascertain their wellbeing, as many areas are closed to aid organizations, reports from the communities indicate that most have not been allowed freedom of movement, are not allowed to work, and have very limited access to healthcare. Too afraid to emerge from their homes, many live in danger of starvation. Additionally, the Burmese government and military have been forcing the remaining Rohingya residents to accept a National Verification Card that lists their nationality as Bengali. This move—which would certify the accusation that the Rohingya are not citizens of Burma—has pushed many of the remaining Rohingya people to flee the country. Global leaders—including UN officials, heads of state, human rights activists and faith leaders—have condemned the Burmese military for perpetrating these atrocities, and its elected civilian leader, Aung San Suu Kyi, for failing to put an end to these attacks. AJWS has decried the violence against the Rohingya people for years, and has joined other human rights organizations in denouncing the current attacks and calling on the U.S. and other governments to sanction Burma. After nearly two months of silence, Aung San Suu Kyi announced the formation of the “Union Enterprise for Humanitarian Assistance, Resettlement and Development in Rakhine” to address the crisis; yet Rohingya refugees and human rights organizations are skeptical that this newest commission will make a tangible difference. What is AJWS doing to address the plight of the Rohingya people? AJWS is providing humanitarian aid to refugees in the Bangladeshi camps and supporting Rohingya human rights activists in Burma and around the world in their efforts to stop the bloodshed. We are also responding to the new challenges presented by the monsoon season, funding first aid and search and rescue trainings for local first responders, as well as supporting the fortification of health posts and community centers to ensure that they can withstand severe weather events. We are also pushing the U.S. government to take action and orchestrating a unified Jewish response. Together with our partners and allies, AJWS launched the Jewish Rohingya Justice Network, a coalition of diverse Jewish leaders from across denominations. Earlier this year, we mobilized 24 American Jewish national organizations, 48 local organizations and 248 rabbis and communal leaders to petition the Senate to pass the Burma Human Rights and Freedom Act of 2018. 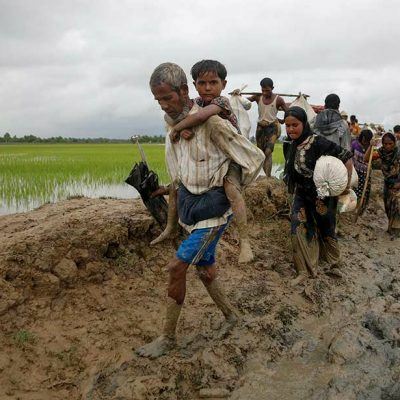 This bill would increase humanitarian aid, secure U.S. sanctions against the Burmese military, and establish a mechanism to help provide accountability for crimes committed against the Rohingya people and other minorities in Burma. How long has AJWS been working in Burma? AJWS has been working in Burma since 2002. For the past 15 years, support for the rights of ethnic minorities, including those of the Rohingya community, has been a pillar of our strategy in Burma. AJWS’s programmatic staff is in close contact with partners in Burma, Bangladesh and London who are monitoring the situation in both Burma and Bangladesh. The current crisis is symptomatic of a larger problem of discrimination by the Bamar majority against minority ethnic groups in the country. To help sustain AJWS’s work in Burma and aid Rohingya refugees fleeing the violence, please support our Rohingya Emergency Response Fund and sign up for our advocacy alerts.